Senator Risa Hontiveros' Akbayan Partylist will be filing, through its Rep. Tom Villarin, impeachment cases against the eight associate justices who voted in favor of the the Quo Warranto Petition against Atty. Lourdes Sereno. I'll tell you how it will backfire GLORIOUSLY. 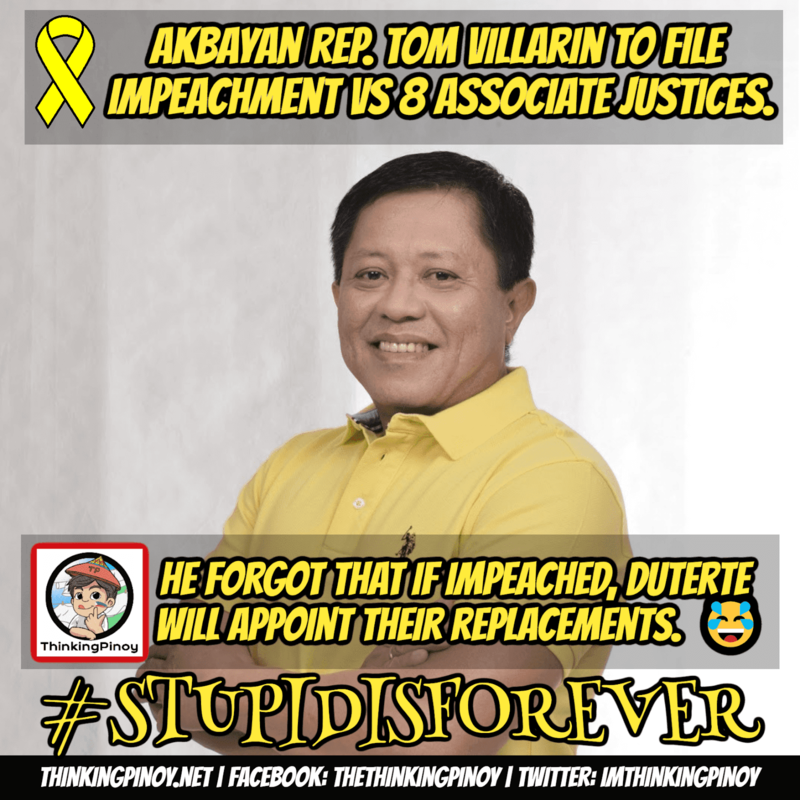 We are talking about same Tom Villarin who served as Mar Roxas' right-hand guy during the latter's DILG stint. He also allegedly masterminded the #NasaanAngPangulo PR campaign, which attempted to pin all the blame over the Mamasapano Massacre to President Noynoy Aquino in order to protect Roxas' presidential ambitions. FIRST and most obviously, Duterte still chooses the prospective replacements. A Supreme Court dominated by Duterte appointees, instead of happening in Q4 2019 or Q1 2020, may happen earlier because it's Pres. Rody Duterte who'll appoint their replacements. That's so sad... for the Opposition. SECOND, the dates of mandatory retirement aren't favorable to Villarin's plans. That is, the first six mentioned are about to retire anyway, as the first five may even retire prior to the conclusion of their corresponding impeachment trial, forcing the Senate to dismiss their cases for being moot and academic. In short, in as far as the composition of the SC is concerned, there's isn't much to fear vis-a-vis Akbayan's drama. THIRD, Gesmundo's removal still means Duterte chooses his replacement. Unless Akbayan has some intricate strategy to manipulate the JBC nomination process (something similar to, say, Sereno's clustering system), then Villarin's plan is but an exercise in futility because again, Duterte will appoint the prospective replacements. FOURTH, Removing Peralta means more Duterte SC appointees. Removing Peralta, meanwhile, will simply add to the number of Duterte appointees in the Supreme Court. It has already been anticipated in June 2016 and before Sereno's disqualification that based on the AJ's respective dates of retirement (they're required by law to retire at 70), there would be 10 Duterte appointees in 4Q 2019 and presumably beyond. With Sereno's disqualification, there would be 11 Duterte appointees instead of 10. Now, Peralta is supposed to retire March 2022 so a replacement may be considered an illegal midnight appointment. With a Peralta impeachment plus conviction, however, Peralta will leave the SC sooner so Duterte will be appointing 12... and there are only 15 justices in the SC. 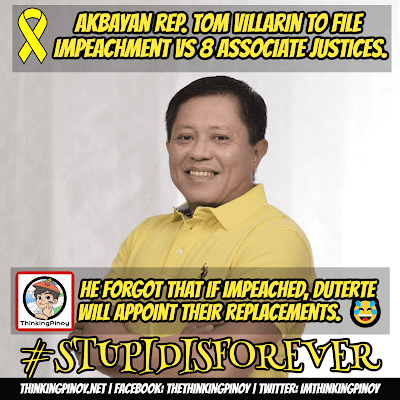 IF VILLARIN'S IMPEACHMENT PLANS COMPLETELY PROSPER, THEN 12 OUT OF 15 SC JUSTICES WILL BE DUTERTE APPOINTEES, INSTEAD OF JUST 10. The only ones that will be left in the current Supreme Court would be Associate Justices Marvic Leonen, Estela Perlas-Bernabe, and Benjamin Caguioa, all Aquino appointees. Note that Perlas-Bernabe is not an Aquino lapdog. 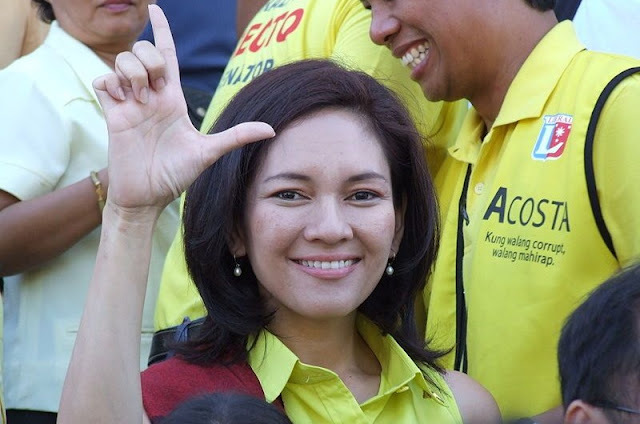 She writes sober and logical decisions, so Akbayan and its overlord the Liberal Party cannot always rely on her. And that's how Akbayan-LP's plan will gloriously backfire. Akbayan-LP's plan is poorly thought of and ill-advised, but I have always been aware that intelligence isn't exactly Akbayan-LP's strongest suit.